Each One Tell One: Wendy Damonte and Her Mom’s Story – Each One. Tell One. RMB is proud to support the local charity of Each One Tell One™, a grassroots movement about dense breast tissue (DBT) and early detection of breast cancer. 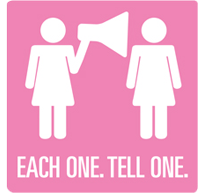 In honor of Breast Cancer Awareness Month, we will be featuring the stories of the founders of Each One Tell One™, as well as their educational materials and videos.